My digital media artwork series Dao Gives Birth to One (2009-2012) will serve here as a case study and practical experimentation project furthering the analysis of how the traditional Chinese concept of time and space can be applied through digital moving images in a long scroll format (see Figure 181). (1) The concept of Dao, (2) the function of the scroll as a form, and (3) the four-dimensional construction of Chinese characters can create temporal and spatial experiences similar to those found in traditional Chinese painting and calligraphy. I am interested in integrating these traditional concepts via digital media technology so as to transform the role of the viewer away from the concept of the ‘Yellow Box’ into an interactive video installation platform. My artwork aims to visualize the cycle of vigour and vitality  of Dao in the universe with the assistance of digital media technology – a topic that has not been broached before in relation to the concept of the ‘Yellow Box’ and digital media. In addressing this issue I have attempted to explore how the concept of sheng (生 ‘gives birth’) and 一 (yi, ‘one’) as used in Chapter 42 of Dao De Jing could be visualized through digital media technology. With reference to my research materials, there are actually different interpretations of sheng (生 ‘gives birth’), including ‘to create’; ‘to give birth’; and ‘to generate’. Translations made by different scholars generally reflect their different linguistic perspectives. In fact, the concept of sheng could be even more abstract, spiritual and philosophical than any available translations. This has led me to question how sheng could be reinterpreted and extended through visual representation in this digital era. To answer this question, I analysed Dao De Jing and the ancient Chinese dictionary Shuowen Jiezi. According to Dao De Jing, the meaning of 一 (yi, ‘one’) reflects a philosophy of how the universe is created through 一 (yi, ‘one’) and Dao. Secondly, the most interesting issue that drew my attention was the Chinese character 一 . This is placed as the first word in the first chapter of Shuowen Jiezi, which states that the 一 originally creates heaven and earth and then generates the whole universe . 一 (yi, ‘one’) represents the ‘unity’ of the universe. And this unity generates ten thousand things which form their tracks in the universe. Everything (ten thousand things) grows in the beginning and will disappear in the end. This approach has not yet been considered as a visual representation platform using digital media. The scene in ‘screen 1’ represents the beginning of the universe. I animated the three-dimensional ‘one’ as a ‘FACC’ flying alone in the universe (white virtual space) after serving as a function to divide the universe into heaven and earth (see Figure 184). through its interaction with the human. Screen scenario of Dao Gives Birth to One (version II). How, then, was ‘two’ (二, er ) created ? The answer is that once human beings appeared in this universe, the form of the characters (‘form imitation’ [象形, xiang xing]) was expanded and created through their interaction. Thus ‘screen 2’ shows how, whenever any part of a human being (such as limb, nose, head) interacts with the ‘FACC’ 一 (yi, ‘one’), this 一 will generate another and become 二, because (Chinese) linguistic characters are meaningless without human involvement . Furthermore, in ‘screen 3’ and later screens, numerous ‘FACC’ are generated in such a way that they become brush stocks. Once these animated and flying brush stocks come across each other, they may associate certain combination of Chinese characters, word phases such as ‘king’ (王, wang), ‘new’ (新, xin) and ‘big’ (大, da), etc. In the last scene – ‘screen 12’, thousands of animated Chinese brush strokes and Chinese characters are flying in this universe, which is used to simulate the concept of ‘a thousand things in the universe’ (see Figure 183). Even though there are a large number of ‘flying animated Chinese characters’ in the last screen, they move on their own track with a certain system, which simulates our human activities in the chaos of the universe. The last few seconds of ‘screen 12’ (the last scene of this long scroll) is about everything returning to white (void) again with only one Chinese brush stock left, which implies the system of our human life cycle in this universe (for details, see ‘DAO Animation Sequence’ in Appendix D ‘DAO’ in DVD ). representation. Screen scenario of Dao Gives Birth to One (version II). Traditionally, the white colour in the pictorial space of Chinese rice paper has been regarded as a void  — an empty space rather than a colour. Although paper is physically a two-dimensional plane, it is regarded as an infinite space with endless time. In Dao Gives Birth to One I attempted to reinterpret the concept of void through digital technology, perhaps transforming the concept of empty space into a concept of virtual space. When these Chinese characters fly about in that virtual space, one almost has the impression of real beings racing back and forth in the universe. This virtual experience has a 4D sense to it. Boris Groys further states that the viewer’s movement in such an exhibition space cannot be arbitrarily stopped because it is constitutive of the way perception functions within the art system: “An attempt to force a visitor to watch all of the videos or films in the context of a larger exhibition from beginning to end would be doomed to failure from the start – the duration of the average exhibition visit is simply not long enough” (Groys 2008, pp. 87-88). I first invited different people to come to my studio to interact with my flying Chinese characters in front of my artwork. In the studio I could shift my focus to different parts of their bodies for the shooting. I then edited all the footage into different lengths and set all of these into the 12 videos as a long scroll screening format, creating 12 video screens with 12 different lengths of running time. Each screen shows how flying Chinese characters interact with humans. The first video lasts 3 minutes; the second lasts 8 minutes; the eighth lasts 21 minutes; and the last video lasts 5 minutes. Because the loop length of each video is different (see Figure 184), various narrative combinations are automatically created. The audiences (viewers) need not worry about the time restriction of the video work, or which part of the videos they have missed, because the video loops run in overlapping phases anyway. In other words, viewers can come and go freely (see Figure 185). times. Screen scenario of Dao Gives Birth to One (version III). The viewers/visitors/audiences are allowed to perceive this long scroll video installation from different perspectives. They can view each screen one by one closely, or from a long distance; the most important point is that every one has his/her own time to observe and take in the video narration. 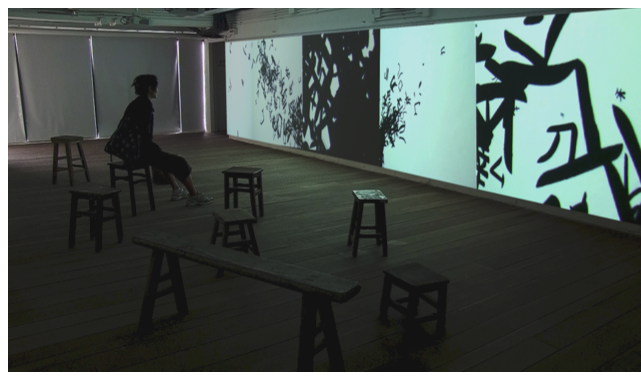 The free and relaxed atmosphere encourages viewers to enter into the spirit of this video work and merge their minds in the exhibition space as a whole. Dao Gives Birth to One (version III). Hong Kong Museum of Arts, 2010. ‘Dao’ project useddigital technology to simulate the reality of Chinese calligraphic characters in terms of time and space. The first step sought to give viewers a temporal experience by having them visualize the entire process of creating these animated characters as a flying sequence. Traditionally, calligraphy has been a completed work of art that gives the viewer neither a physical nor a temporal experience. In general, therefore, viewers who face a work of calligraphy should try to imagine the process underlying the creation of the characters: for example the characteristics of the first brush stroke, the sequence of brush strokes, and the flow of movement connecting one character to another; this will enhance their appreciation of the work. However, being in a digital era, my new approach was to invite viewers to ‘witness’ and ‘experience’ the whole process of character writing through digital animation sequences (see Figure 186). Figure 186. An animation sequence of the writing process from one brush stroke to the final Chinese character. To better understand this process, let’s take a simplified Chinese character, ‘horse’ (馬, ma), as an example. I not only animated the motion of the form of 马, but also visualized the character’s underlying process of writing through sequenced images. In other words, the viewer can see how this character was created from the first brush stroke to the final stroke in real time. At this point, the appreciation of Chinese calligraphy is no longer centered on a completed work of art; instead, comprehensive appreciation includes the concept of time, creating a sense of growth and duration, a temporal experience. The second method that I used to engender a 4D experience of my artwork in viewers involved creating Chinese brush strokes (and characters) through digital technology. In this endeavour I revisualized the characters’ three-dimensional forms by using such digital technologies as 3D modelling, interactive programming and video making (see Figure 187). I argue that Chinese-character writing contains the seeds of 3D and 4D experience, which become manifest only when a traditional calligrapher controls the volume of ink and the pressure of brushes on a 2-dimensional writing platform . Figure 187. The animation sequence of a Chinese character as visualized through a 360° view. Here, I took the Chinese character for ‘mouth’ (口, kou) as an example of how a flying Chinese character could be visualized through a 360° view. I designed the flying sequence of this character as a shape that, while in motion, flips from left to right. When the viewer watches this character zooming around in virtual space (void), the character’s motion suggests a three-dimensional form, rather than a flattened, 2-dimensional image. When the characters ‘mouth’ (口, kou) and ‘horse’ (马, ma) are flying together, a sense of spatiotemporal experience is created. 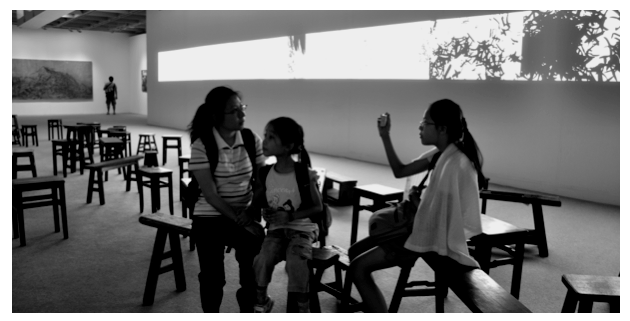 Finally, through physically touching the old Chinese chairs viewers can feel closer to the exhibition space. And the longer they sit on the chairs, the closer the empathy they feel with the material object (see Figure 193). The materiality and function of the chairs reflects the relation between the human being and a natural object, corresponding to Zhuang zi’s concept of Dao “Heaven, Earth and I were created together; All things and I are unified as One” . Viewers can merge into spiritual and material space through this embraced environment (see Figure 194-195). Arts Centre, Hong Kong, 2009. In conclusion, ‘landscape-characters’ suggested a new approach to combine shu hau in a long scroll format as a visual representation platform. The ‘Opening show of the Beijing Olympics’ demonstrated how digital technology could implement the concept of long scroll format. However, the notion of ‘play-appreciation’ and a sense of intimacy through viewers’ bodily engagement have not been considered deeply or realized to any significant extent. Therefore, Dao Gives Birth to One demonstrated how the traditional concept of handling time and space could be represented through an interactive video sequence in a long scroll format. Figure 195. 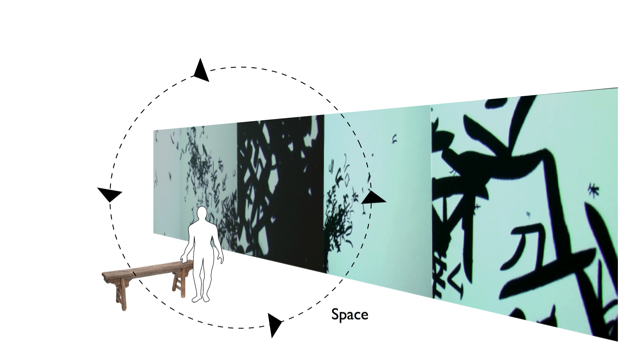 Merging viewers into the exhibition space (visualization by the author). Further, through extending the function and the materiality of those old Chinese chairs to the exhibition space the Dao project suggested a sense of intimacy among human beings, Chinese characters and the universe. Most importantly, in comparison to ‘landscape-characters’ and the ‘Opening show of the Beijing Olympics’, the Dao project suggests a new visual representation platform for digital media art through applying the concept of the ‘Yellow Box’. The role of the viewer has been shifted from observation (passive role) to participation (active role), from where it has become an interactive role. According to a visual analysis by the Koiso Design Institute, Nippon Design Center, standard script in the early Tang Dynasty was characterized by the Wan Xizhi movement’s emphasis on vertical lift, which was regarded as the most significant aesthetic model in history (Hidden Principles of East Asian Character Universe 2006). For example, the character shu (書, ‘brush writing’) shows how the shape of Chinese characters has evolved since the Tang Dynasty from a dynamic flow to a subtle and balanced visual presentation (ibid.). These analyses show that in the early Tang Dynasty some Chinese characters were originally treated as three-dimensional rather than flattened forms. I argue that such three-dimensional forms can be revisualized through digital technology. Dao is regarded as the ‘primordial natural force’ in nature and it contains unlimited ‘potentiality’ (潛藏力) and power of creation. But there will be an end, inasmuch as life is growing. However, ‘the end’ suggests the advent of another new life (Chen 2007, p.63). “The Dao (道) gives birth to One. One gives birth to Two. Two gives birth to Three. Three gives birth to all things. All things have their backs to the female and stand facing the male. When male and female combine, all things achieve harmony” (Mitchell, 1988, p. 48). “The Dao generated One; One generated Two; Two generated Three; Three generated the ten thousand things. The ten thousand things, carrying yin and embracing yang, used the empty vapour to achieve harmony” (Huang 2003, p.76). Huang’s version is based on the Silk Texts A and B unearthed from the Han tombs near Changsha, Hunan Province in China in 1973. The ancient Chinese dictionary Shuowen Jiezi ‘Explaining Simple and Analysing Compound Characters’, defines ‘one’ thus: “Unity (一): It is, that starts the Great Begin of the Way is based upon Unity. It divides Heaven and Earth and forms the ten thousand creations” [sic] (Shuowen Jiezi 2008). Chapter 42, Dao De Jing, “The Dao (道) gives birth to One. One gives birth to Two. Two gives birth to Three. Three gives birth to all things. All things have their backs to the female and stand facing the male. When male and female combine, all things achieve harmony” (Mitchell, 1988, p. 48). According to Shuowen Jiezi, one of the processes of creating Chinese characters can rest on the features of our bodies or on perceptions of objects from afar (see Chapter 1.1.4). The concept of void in traditional rice paper suggests not only a sense of endless time, but a sense of infinite space, as well. I hope to meet you at the ISEA Conference in Hong Kong. I will be giving a presentation that incorporates your work and ideas on Thursday morning at 9:30 am. I will also attend your presentation on Saturday. I hope that we may collaborate in writing and publishing articles in the future. Please contact me when you have a chance. I am an art historian that writes about contemporary artists that incorporate traditional Asian philosophy and aesthetics into their own work using digital technology. Jean M. Ippolito, Ph. D.